Ok y’all. This is my first One Room Challenge! 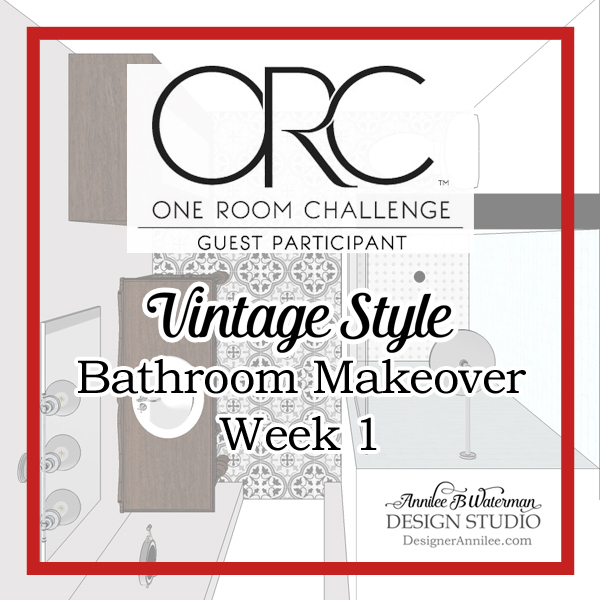 I’ll be showing you the transformation of my bathroom, from dim-dingy-no-style to Light, Bright Vintage Style. Believe it or not, this is my Master bathroom. Our house is a Vintage, 1973 Cape Cod style cottage, which means small bathrooms and sadly small closets. So, we have to make the best of the small space. Here it is. This is the first pic I took of it, when we moved in. It was bad. Goals: Make if feel bigger. Make it Brighter. Make it vintage style. Choose vintage style modern fixtures, mixed with converted antiques. 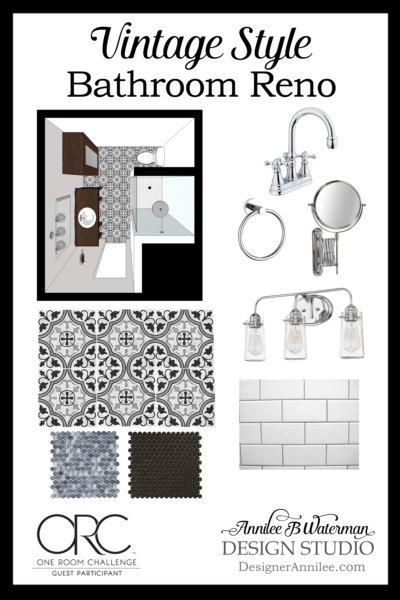 When this bathroom was originally designed, (I found the original blueprints in a closet!) there was going to be a bathtub and a shower. 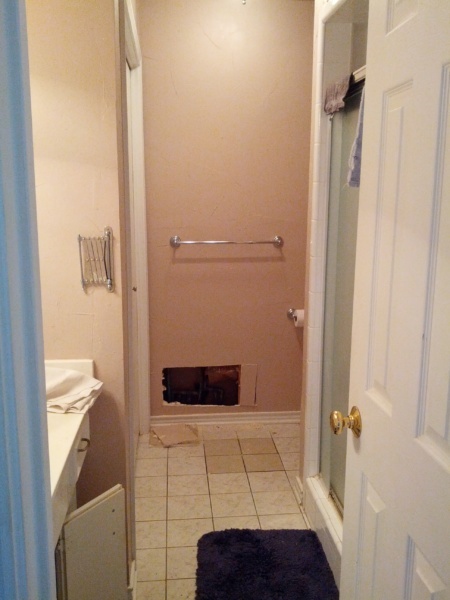 At some point, the builder changed his mind, and the bathtub became a closet. While I do like having that much storage, it’s seriously got to go. It’s just too big for the room, and is a big reason for the claustrophobic feel. The shower is tiny. Less than 3’ x 3’, with a lowered ceiling, and boxed in framed glass door. We plan to reframe it, raise the ceiling, and widen the doorway. We should gain about an inch in each direction, which doesn’t sound like much, but I think overall it will feel much better. The lighting currently is basic, not the original 70’s, just off the rack ugly. We want to replace the ceiling fixture with a recessed LED can, add a recessed can in the shower, and do a vintage style over the vanity. This bathroom is in the middle of the house, on the first floor, so, no windows. Boo. To bring in natural light, I’m adding a Solar Tube. From what I’ve read, these things are amazing, I can’t wait. Say goodbye to the 80’s era mauve paint too. I’m considering using white paint on the walls. This will be new for me y’all, I’ve always done color! I’m always shopping antique malls, Craigslist, FB marketplace, etc for vintage finds. Typically, I am not a fan of cutting up or painting over beautiful antiques. Sometimes however, they are already damaged, which means they are eligible for upcylcling. I have found a perfect antique buffet that I will convert into the vanity, and an antique wardrobe that will be used for storage.